This Chicken Junglee Pulao is an easy, make-ahead, one-pot dish perfect for the busy weeknight dinners! This pulao is an Anglo Indian rice recipe. The Hindi word “Junglee” and Bengali word “Jonglee” means wild! This recipe has a huge flavour hit from the great marinade. It is absolutely suitable for Desi tastebuds, or someone enjoys spicy food! It will take hardly 10 minutes to do the prep-work. Once the chicken is marinated, you can cook and serve the dish for lunch, lunchbox or dinner within 30 minutes! Now, let’s talk about the key ingredients of the dish, one is Basmati rice, and the other one is Chicken! Medium size bone-in skin off chicken pieces are perfect for this recipe. But I like to use Chicken drumsticks because they are pocket-friendly, at the same time full of flavour. If you regularly cook Indian food at home, then chances are all the spices you have in your spice cabinet. Now, this is how I do my meal prep. When I buy proteins for my weekly meal plan, I buy for four meals. I find that way I can reduce the time and energy for prep work. For example, if I make Chicken Junglee Pulao for Tuesday dinner then obviously leftovers will be our Wednesday lunch. With rest chicken drumsticks, I can make Fried chicken for Friday dinner or coriander chicken curry for Saturday lunch. All I have to do is, marinate the meat with ginger garlic paste, then divide it into portions and use different spices. Then put in freezer friendly containers and voila! We are sorted for four meals! Back to this Pulao, if you freeze the marinated chicken, then depending on the weather of your current location you need to bring the chicken to the regular refrigerator. In my case, during winter month it takes 24 hours to thaw the chicken in the fridge, then I keep it on the kitchen counter at room temperature for 30 minutes. At the same time wash and soak the rice for 30 minutes, then start cooking. You don’t need to stand in front of your cooktop for a longer time! I love this type of recipe, don’t you? I don’t know what do you think? Do you find this is a lot of work? Honestly tell you, it is not. Stay tuned for my meal plan strategies post. I need to say to you so many fun stories and strategies that I learned over the years! 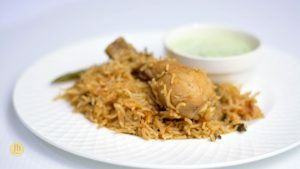 By that time enjoy this Chicken Junglee Pulao, it is so flavourful that you can eat all by itself. But if you wish, then you can serve a Raita with it. In a mixing bowl, take the chicken drumsticks (bone in and skin off, you can take any bone-in chicken pieces of your choice!) and add cumin powder, coriander powder, red chilli powder, ginger and garlic paste! Sprinkle salt to taste, add beaten yoghurt and mix everything well. let it marinate for 2 hrs. Soak the Basmati rice in the water for 30 minutes, after that, drain the water and keep the rice on a sieve! In a cooking pot, preheat cooking oil. Add all the whole spices ( i.e., cinnamon, cloves, green cardamoms, bay leaves) to the hot oil and keep stirring for a couple of seconds till the spices release the aroma. Sprinkle salt and add sliced red onion. Cook the onion till it turns to almost brown colour. Over high heat cook for a couple of minutes. Add about a half cup of water.cover with a lid and over medium heat cook for 7-8 minutes. Add the chopped tomato now, put the lid back again. Continue cooking over medium-low heat till the chicken is almost 90% cooked through. Stir the chicken a couple of times, so that it doesn't stick to the inner bottom of the pan. When the oil is releasing from the spice mixture add the chopped coriander, half of the chopped mint leaves and the soaked rice. Increase the heat to high and stir the rice and chicken for 3-4 minutes. You will see that the texture of the rice will change, this process will help to remove the starch from the rice and we will get a fluffy Pulao. Add boiling water. The ratio of Rice and water is 1 cup rice to 2 cups boiling water. When the liquid is boiling, add a little bit of sugar to balance the taste of tomato. This is totally optional. Then add slit green chillies, remaining chopped mint leaves, reduce the heat to low, put the lid on again. Cook for 10 minutes, then turn off the heat and give 10 minutes resting time, by that time you can make a quick raita. Today I am serving this spicy Junglee Pulao with cucumber mint raita.